At Front Range Modern Quilt Guild last Saturday, members shared their "first" and "most recent" quilts. I forgot mine in the back of the Tardis (that's another story) when it got a flat tire on the way to Guild. So here is my story! My very first quilt was started the summer I was 8 years old. We had just moved from the family farm into town, and I didn't have any friends or any way to make friends with school out for the summer. So my mother set me to cutting out squares of calico fabric to piece a 9-patch quilt. Each square was the width of the cardboard that held bias tape -- about 3" square. She patiently taught me to use her Singer 401 Slant Needle machine (which I inherited when she died). After a few days of having to change the thread back to the color she wanted following my use of the machine, we went downtown to Hendrickson's Sewing Shop. She bought me an old Singer portable that only did straight stitch, but a beautiful straight stitch! 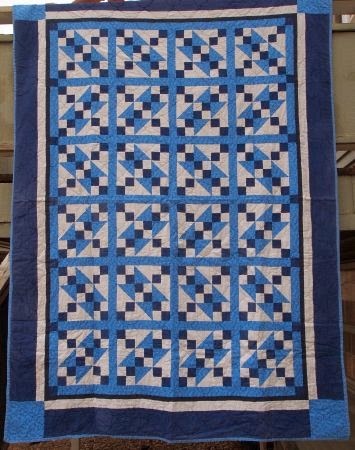 I finished piecing that quilt only a few years ago, but I don't know what I've done with it -- I don't think I gave it away, but I can't find it! My next foray into quilting was in January of 1976. I had graduated High School in December, and was waiting for my fiance' to return from Air Force technical training school so we could get married. Mother helped me tear strips and piece a log cabin quilt a la "the Eleanor Burns method." It was blue and mauve, very popular colors in the 70s! I gave that quilt to the Goodwill when we moved to Virginia in the 90s. It never occurred to me I would want a photo of "my first quilt!" The earliest quilts I still have were made for my two boys when we lived in Virginia from 1992-1996. The patterns were in a book by Sharon Hultgren, the inventor of the EZ Angle. I have to admit, her directions were a little "spare" for a beginner! The dark blue is faded, and the single-fold binding is worn through. 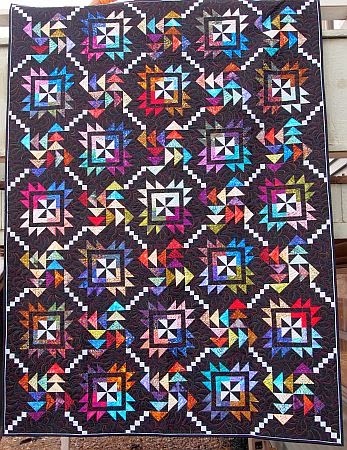 But I still love this quilt! For several years when I substitute taught Art classes in Hampton, I used this quilt as an example of "Complementary Colors." Complementary Colors are opposite each other on the color wheel, and when placed next to each other, appear to vibrate. I'll say! 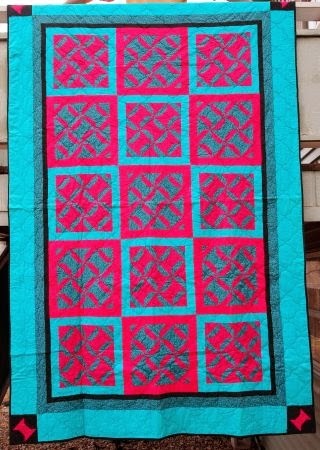 When we evacuated for Hurricane Emily, I took this quilt and my sewing machine. It was half-pieced. 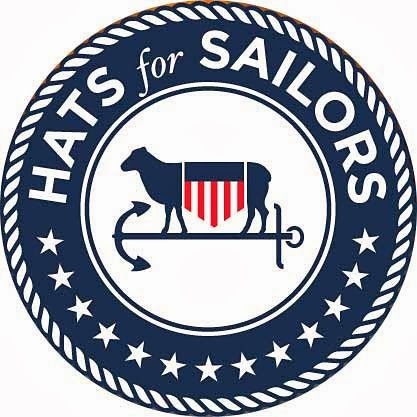 I knew from meeting people who had evacuated for Hurricane Andrew the year before that there might be nothing left when we returned to Langley AFB. And I wasn't going to piece those spinning spools again! Luckily, Emily dodged the Tidewater Region and we had an enjoyable evacuation at a "hotel with an indoor pool!" You've seen my most recent finish, "Main Street." I still like bright colors and precision piecing! And I still use the EZ Angle to make half-square triangles. From 9-patch calicos to batik flying geese -- I'd say my journey of nearly 50 years' quilting has been a good one! I hope you've started your "Block a Day." Go here to see the turorial on the Bethlehem Star block we're making for the Spring challenge. Interesting tale - Its such a shame that you can't turn the clock back and take a picture or two. I hope your first quilt top turns up eventually. Maybe its squashed behind something at the back of a cupboard somewhere waiting for its turn, you never know! Who knew back in the '70s we'd have a way to share quilt photos without paying postage?!? Great first quilts and stories, especially your then 4-year-old's choice of colors. Your stories have ignited many memories. (The hospital where my adopted son was born was destroyed during Hurricane Andrew...) I may have to put together a blog post about my first quilt projects, so thank you for that inspiration. I've been pondering your block a day challenge for a while now, and I thought at one point, well, maybe if I can't make a quilt square a day, I might be able to make a crochet motif square a day. That was a while back. And I've finished only three motifs, and they weren't completed in a day each. So much for that substitute challenge! It's been lovely to read about your start in quilting. I love your son's choice of colours. He was obviously a very happy boy since he choose such bright and cheerful colours. My favourite colour combination when I was that age was bright orange and purple. This sure was fun to read. Anxious this weekend to get the BaD going. I don't want to get too far behind...but my March UFO Konstituent and Kranberries have taken over my sewing room for now...rightfully so! 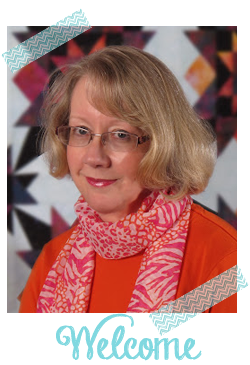 I loved reading your journey in quilting Marti! Thank you so much for sharing it. Your quilts throughout the years have been beautiful expressions of your talent and love. Treasures!! !